I have been a fan of "long" stones for a really long time, and the beaches around here seems to have quite a few of them. Perhaps their relative "rarity" is part of what appeals to me. Everything we find on the beach gets "tumbled" by surf, sand and other rocks. If you have ever stood by a rocky shore during (or after) a storm, you know that waves breaking on the beach-- aside from their majestic beauty-- can be a very violent process. "Long skinny" rocks are relative rarities because they are more likely to break in half in rough surf. A "long" stone presents a completely different design challenge from a round stone. 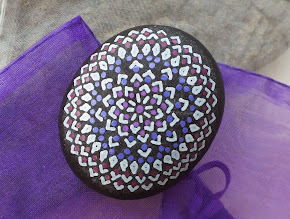 Whereas it is certainly possible to create some "version" of a round symmetrical "mandala" style design, long rocks lend themselves better to what I call a "garland" or "vine" type design. What I mean by that is that I like to use the curves and shape of the stone and "wrap" the design around it. Sometimes the stone will have a soft curve, a bit like a banana, and I try to work with these subtle natural shapes. The core idea behind an Alchemy Stone is to always try to make the decoration and stone seem like they "naturally belong" together. 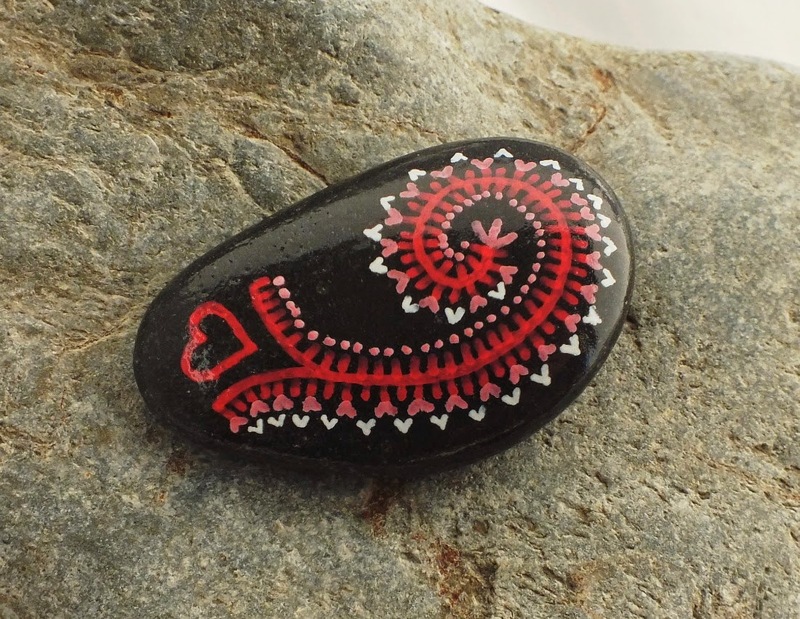 Alchemy Stones came about as a result of combining a love of the beach and beach combing with a love of beautifully rounded rocks in interesting shapes and colors... with a fascination for nature's sacred geometry and drawing tiny intricate patterns. An Alchemy Stone might be a "talisman" for some, a "sacred object" for others, simply "a lucky rock" for a few and there are also those see them purely as small works of art. Whereas there is no "correct" way to consider an Alchemy Stone... THE correct way is the way that feels right to you. Alchemy Stones Shops: Choose Your Stone!